Triumph's Product Manager talks Speed Triple R. So what are the chances of a 1200 version Simon? 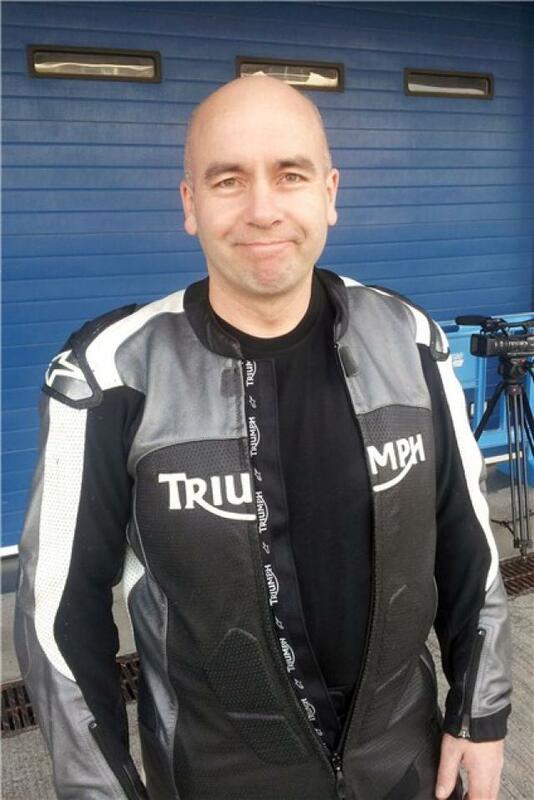 At the launch of Triumph's new Speed Triple, I spoke with Simon Warburton, Triumph's Product Manager, on the new bike, the chances of a 1200 version, the rivals and Triumph's development direction. You've revised the Speed Triple R's gearbox and claim it's slicker. Will we see these changes on the standard Speed Triple too? Yes, we've made many changes to the gearbox over the years, however this new gearbox is almost completely redesigned, with 10 of the 12 gears and both shafts being new. Also, the old gears used four dogs but the new gears use five, so that means more opportunity for the gears to engage, making the action smoother. We'll use this new gearbox in the standard model now too. Will we see an 800 or 1200 Speed Triple? There have been a few people who have said 'Now you've got this great 1215 engine, why don't you put it on a Speed Triple?' Quite simply, it wouldn't be a very good Speed Triple. It's too big, it's too slow-revving, it doesn't have the right character at all. The Speed Triple needs an exciting engine and with the 1215 engine it would be like building a [BMW] K1300R which is not what we want to do. Not in the immediate future. It's something we're aware of [with the Street Triple] we're halfway between where the market is going in terms of the 750/800s and the 600s, so we're alright for a bit but in the future we might look at that. So if you had to make this Speed Triple R £1000 cheaper, what would you change? The wheels and suspension are probably fairly similar in cost - they're both very expensive parts and you'd have to take one of those off to save £1000, so I'd say we'd probably swap the forged wheels out for standard wheels. The Speed Triple R is being launched on a track; it's got stiffer suspension and stronger brakes. Is it going to be any good on the road? Well, there are three settings in the manual; Comfort Sport and Track. The bike comes as standard with our Sports setting, which is stiffer than the standard Speed Triple's settings. If you set it on the Comfort settings it'll be absolutely fine on the road and if you're purely a road rider, that's what I'd opt for. The beauty of this suspension is there's a wider range of adjustment, so whether's it too stiff or too soft, you can make a big difference. Is there going to be a 'proper' Street Triple R, just like this Speed Triple R with all the goodies thrown at it? I think that'll be very very unlikely. So does the fact you're not going to build a 'proper' Street Triple R mean that the model's days are numbered and an 800 is looming? No, the reasons we're not going to put Ohlins and forged wheels on the Street Triple R is that it'll take the price to daft levels, which is the same reason we never put forged wheels on the Daytona [675R] as it would have taken the price into the realms of the litre-superbikes which is the wrong place for it to be. The Street Triple R has adjustable suspension, radial brakes and it's selling well, so we're not going to change that. Who is your target customer and what bike are they going to becoming from? There is no clear answer to that! Every time we have tried to work out where they are coming from, you realise that people make big changes across different styles of bikes and not just similar bikes in a set class. So we find people move from Adventure to try a Cruiser then they might check out bikes in this sector. Obviously we look at the bikes we're up against and people who are going to buy this bike appreciate what a Speed Triple is, the character of the engine, quality of the chassis, the looks of the bike but they also want something more exclusive and the very best there is. So what bike in the class would you hope they'd choose a Speed Triple R over? There's the obvious comparison to the Ducati [Streetfighter] as it has an image of exclusivity but the Speed Triple R is cheaper than the standard Streetfighter. However that market is really quite small. Some of the people who buy this are people who would have otherwise bought a Speed Triple, so there will be a bit of cannibalisation there. You plan your bikes 3 years in advance, so where do you think the market is going? It appears to be flattening out now. This year, as with past, outright numbers are dropping but there's a slight growth in the Adventure market. Cruisers have flattened out and Touring has increased a bit but it's such a small sector, bikes like the BMW K1600 appear and influence sales but it's only a spike. Roadsters have been going down. However, the answer to what you do doesn't really change, what does change is how many you think you're going to build. The decisions we make about what bikes we're going to develop are pretty much the same unless you've got one bit of the market that's going in a different direction to the rest of the market and in the UK, with all sectors falling, we don't change our plan.